Rekindled Moments: Ms. Loretta Grayson - Our Cherryarte November challenge Judge! Ms. Loretta Grayson - Our Cherryarte November challenge Judge! We would like to welcome Ms. Loretta Grayson, one of the DTs of CherryArte as our judge for Rekindled Moments' 1st Cherryarte November Challenge! Ms. Loretta Grayson has been scrapbooking since 2003 and has also participated in various paper and mixed media crafts over the years. 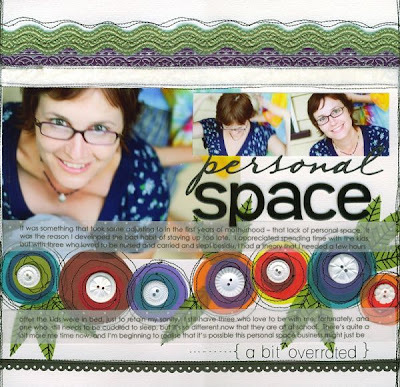 Loretta is a regular contributor to Australian scrapbooking magazine Scrapbook Creations in the Design Inspirations feature and as a member of the Technique Team. Ms. Grayson lives in Queensland (Australia) with her husband Pete and their three children Nicholas, Ruby and Max. You can check out Ms. Rett's LOs at her blog, click here. For the Challenge's mechanics,click here. For the beautiful sample LOs that RM's resident DT, Ms.Cookie Aguilar made,click here. SPECIAL NEWS: Our 1st DT is . . .